Darryl: This my calling. I have to make the world a better place for my children. Kevin: Children? Man, you got to be with a woman first! When I was a little kid, my brother and I would often play "Batman and Robin." Of course, very little actually got done because we would spend so much time arguing overwho would play Robin and who would play Batman. Using some ornately made masks(much better than the ones on the TV show) and trusty bathroom towels as capes, we savedthe world many times over. Blankman opens with that familiar scene playing outin a small apartment where two children, Darryl and Kevin, watch Batman on TV. The film later shifts to their grown up lives, when Darryl (Damon Wayans) and Kevin(David Alan Grier) live together in the same apartment with their grandmother. Kevinworks for a sleazy television tabloid show and Darryl, who's a bit geeky and eccentric,spends all day in strange inventions made using homemade junk. Unfortunately, as adults, Darryl and Kevin live in a terrible section of the city and have todeal with the realities of crime. When their grandmother is killed in a brutal attack aimed at a local politician by a mafia boss, Darryl decides that enough is enough. Using hisknowledge of gadgets and chemicals, he creates a homemade, bullet-proof costume anddeclares himself a crime fighter. He eventually gains some local fame and, unable to comeup with a good name, calls himself 'Blankman.' He expects Kevin to follow suit andbecome his sidekick, but when he doesn't, Blankman goes out on his own, taking refuge inan abandoned subway station he calls the "Blank Station." Along the way, in his battle tostop crime, he falls in love with news reporter Kimberly Jonz (Robin Givens) whoalso happens to be a co-worker of Kevin's. Despite being unbelievable, Blankman succeeds at being good-humoredthroughout most of the film. It's a superhero parody that feels more natural than those that use forced jokes at the expense of the obvious. It's silly and good-natured, although the light-hearted handling of the mob murder subplot was a little strange. There's also a lot of bathroom humor, but strangely, it fits. Another thing keeping Blankman's feet on the ground is that it never wanders into bigger-than-life territory. It's supposed to be about two guys living in slums fighting the criminal elements, and as such, it never devolves into lots of special effects or ridiculous action sequences. It gets absurd, yes, but it's meant to be stupid at times. It won't win any awards for brilliance, but I laughed a little and generally enjoyed the film. It also proves you can make a decent comedy with a central cast of African-Americanswithout succumbing to the "Post-Jimmy Walker" syndrome of getting laughs byacting like complete clowns. Overall, Blankman is far more successful at beingwhat it is than Robert Townsend's amazingly poor attempt at superhero parody,Meteor Man, probably because writer Damon Wayans knew enough was enough. It's charming and laughable, and doesn'treally expect you to take anything away from it other than a chuckle or two. Image Transfer Review: The disc contains both a widescreened, anamorphic version and a full-screen version. Unfortunately, both have their share of problems. While the widescreen side is generallypleasing, there is a substantial amount of heavy grain in the image, leading often to 'dirty'scenes with a lot of background movement. This alone is not a big deal, but the severeamount of edge-enhancement is. The sharpening causes massive ringing and distortion oflines in almost all sequences, which also leads to heavy moire patterns everywhere forthose with non-component video. All the fine detail is heavily effected by this. Thefull-frame version, while losing some composition, is ironically more acceptable as theedge-enhancement isn't as severe. Audio Transfer Review: The Dolby 5.1 mix is very expansive and sounds theatrical. While the musical scoremakes the most of use of the soundfield, the rest of the track is nicely balanced andwhenever a sequence with appropriate action comes along, the soundtrack follows it well. There are split surround effects, but not too many. The Dolby Surround track follows inthis basic trend, but lacks some of the theatrical/auditorium feel of the 5.1. Extras Review: There is a theatrical trailer and 8 subtitle tracks, but no other features. Presentation isbasic and functional, but obviously nothing over-the-top. The 28 chapter stops generouslysplit up the movie into good portions. 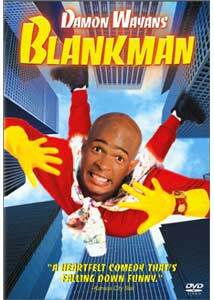 Blankman is middle of the road: not hilarious and not awful. It has some nicemessages and manages to provide comedy without getting too brutal either visually orcomically. Worth a rental, but purchase is strictly for the fans.